When you sign on for a year-long project lots of things happen you did not expect. Last post I spoke of being happily surprised that folks who appear in the weekly Santa Cruz Good Times Local Talk column are so pleasantly countenanced. 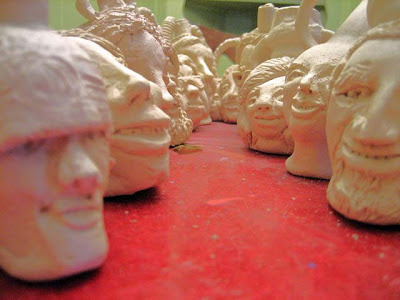 (I am basing my 2009 one-a-week small face jug project on these faces; first 13 weeks crammed into the shot above.) I guess anyone who agrees to answer the question man is, well…agreeable! Some things I have never seen in the column: an answer without a photo…..a dog or thing instead of a human in the picture, someone really mugging, or with their hands in front of their face, turned sideways or backwards…or even looking miserable like in a booking mugshot. Does that mean my facial sampling is skewed a bit towards the thoughtful, articulate, courageous and well-socialized among us? Sure! And, I am fairly sure that sometime in the past, one or all those things I don’t recall seeing have actually been there. This year, however, I live in a bit of dread about them. What, artistically, will be my response if it happens? Maybe I don’t want to know. Maybe I will pick that shot and really get stoked on the relief of seeing something new. Maybe I will play it safe. Oh, yeah, and please, Good Times, don’t cut the budget for this column this year! I have thought of alerting the publication to my efforts, but it feels both wrong and premature. I need to let it all unfold as it will, being a patient B.S.-in-Sociology participant-observer! It’s heady enough (pun intended) sharing it with my family, friends, Art Salon and you out there in the cyber ethers. Let’s keep it our little secret and surprise the Good Times later, OK? And let’s hope they don’t surprise me too badly first.